JDJ presents Future Homemakers of America, an exhibition of new work by Mark Barrow and Sarah Parke. Conceived specifically for The Ice House, the installation includes recent paintings on hand-woven fabric, drawings, a window installation, and wallpaper. The exhibition’s title, based on the career and technical student organization, is both a tongue-in-cheek reference to a bygone era and a nod to Barrow and Parke’s artistic and domestic collaboration. With their studio based in their domicile, the artists seamlessly fuse together their work and home lives, much like The Ice House itself, which was originally built in the 1920s as part of a mixed-use agro-industrial compound and living quarters, and now serves as an exhibition and domestic space. 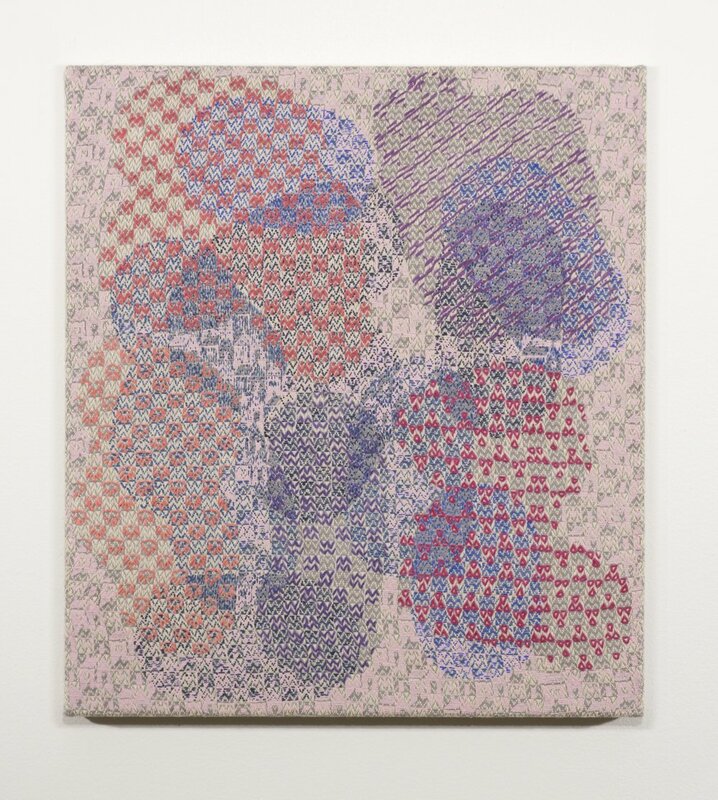 For the past decade, Barrow and Parke’s practice has explored the logic of weaving and its relationship to visual and digital systems. 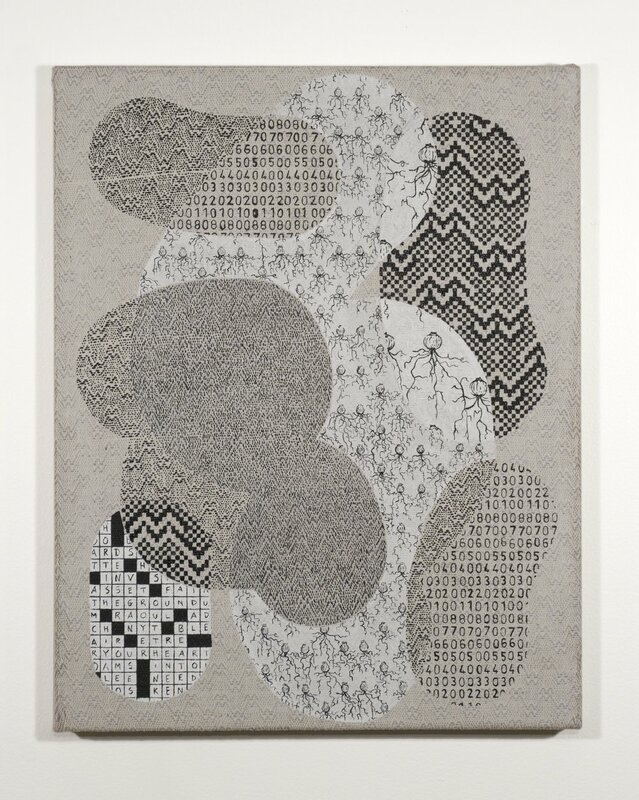 This exhibition marks a shift in the duo’s oeuvre with the introduction of images that emerge from patterns they have developed for wallpaper, textiles, and paintings. On one hand, the patterns function as decorative motifs. 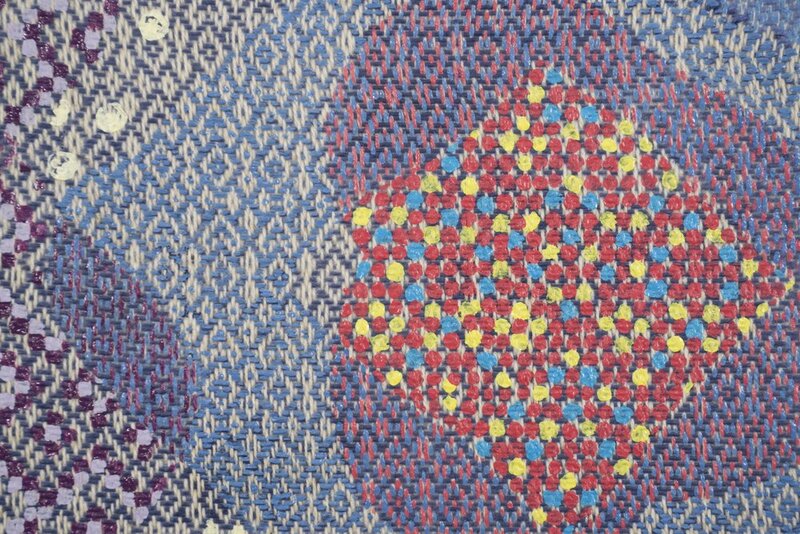 But on the other, these patterns represent the commonality between one idea and another. For example, in the titular painting and the wallpaper, the artists have adapted a classic American schoolhouse quilt pattern from the 19th century to reference the silhouette of The Ice House. Further, the paintings and drawings are rife with repeated designs— a peach tree, an onion’s root system, the stages of the moon. 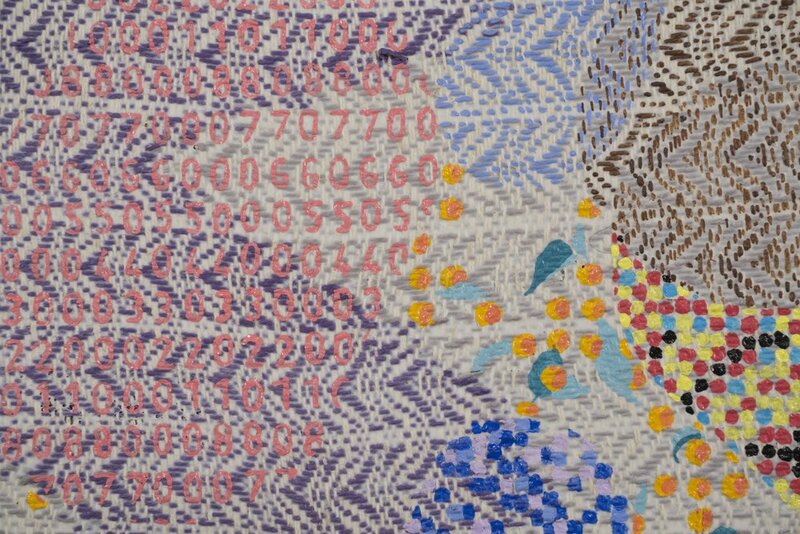 This imagery, when contextualized within the artist’s world of thread and paint, offers strange juxtapositions as well as insight into their methodology— reducing materials, images, and ideas to their most basic forms, until everything becomes interchangeable. 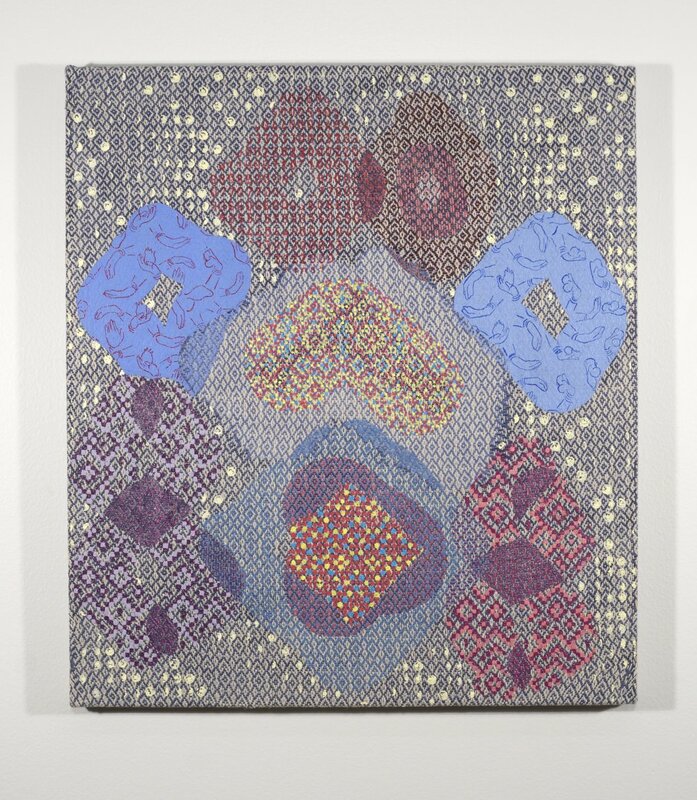 Featuring a floral motif based on an Islamic tile design, Origin, 2019 hangs beneath a window with an aperiodic tile pattern made from transparent colored gels. Taken together, one can draw a link between their underlying geometries, suggesting infinite expansion and a sense of spirituality. 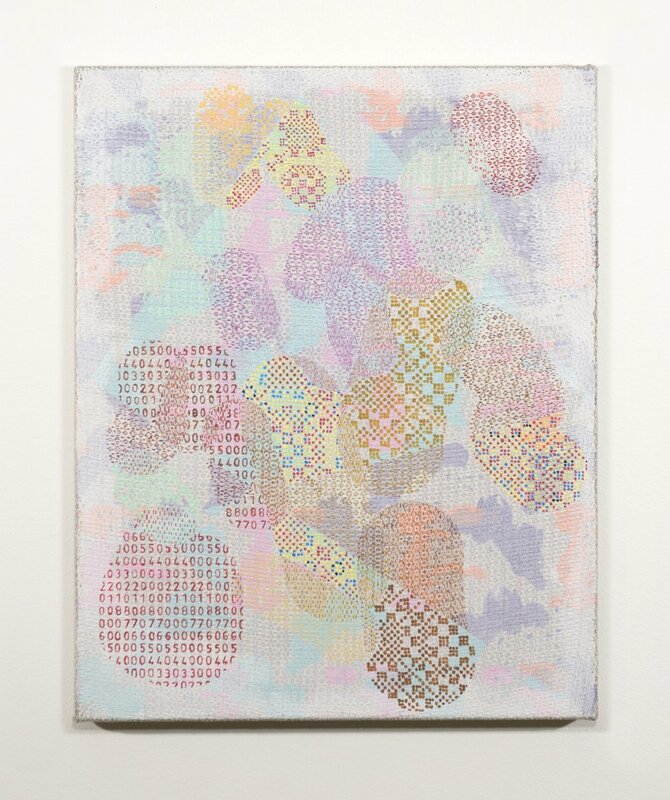 In Eden, 2018, the mythic apple tree is replaced with a peach tree pattern, whose fruit is positioned like the picks of a weaving draft and whose visual shorthand is closer to that of an emoji rather than a convention of painting. The Gold Standard, 2019, featuring a pattern of Scrooge McDuck and Krazy Kat, references the rise of abstraction, which coincided with the departure from the gold standard monetary system in the 1930s. In a society where reality is based more in abstraction and systems of representation brought on by technological advancement, these two characters, suspended in motion, are forever on the cusp of tactile engagement with the world and the loosening grip of reality based in concrete, tangible objects. Scrooge, captured in the moment right before diving into a pile of gold, and Krazy, captured in the moment right before being hit with a brick, serve as morally ambiguous foils for humankind. Mark Barrow (b. 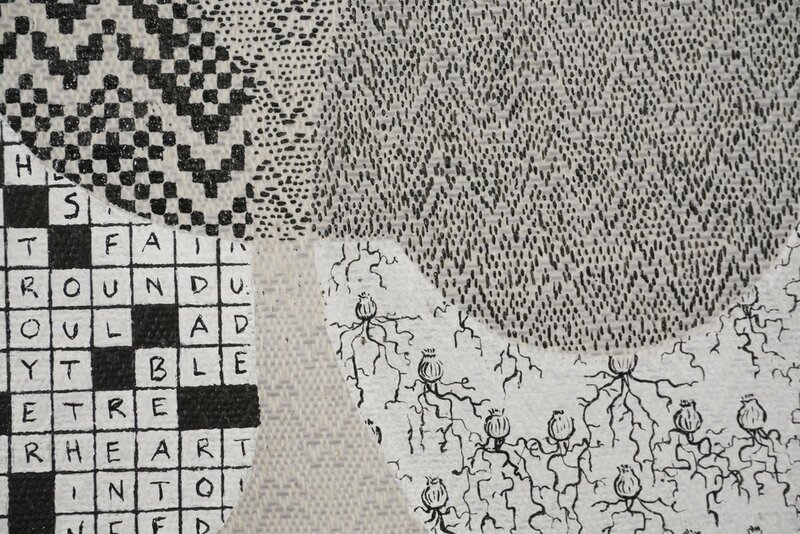 1982) and Sarah Parke (b.1981) live and work in New York City. Their work has been recently exhibited at La Capella Cavassa, Saluzzo, Italy; Rose Art Museum at Brandeis University; White Columns, New York; Le 109, Nice, France; ZERO..., Milan; Galerie Almine Rech, Paris and Brussels; and Elizabeth Dee, New York.